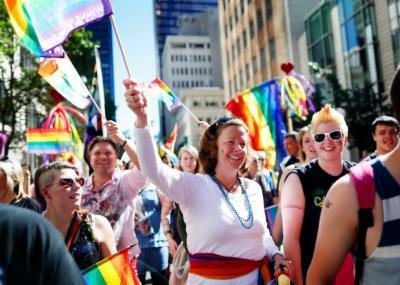 CALGARY – A bus driver who had threatened to quit his job if he was assigned to drive a bus wrapped in a rainbow flag to mark Calgary’s Pride parade announced Friday he has been fired. Jesse Rau distributed to media his termination letter from Calgary transit, saying he had been fired in part for his stance on the Pride bus, for speaking out to the media and for things on his Facebook page. “I expected that my job was totally on the line … so the fact that they fired me, it’s hurtful, but like I said from the very beginning, I knew that was going to be on the table,” he told reporters. In the termination letter, city officials said Rau — who was still on probation — was losing his job for breaching the city’s code of conduct and media relations policy. The letter pointed out that Rau had never been asked to operate the Pride bus and was specifically advised he would not be assigned to it. The termination letter also cited a concern with the Facebook page of Rau, who is a member of the Street Church, an outspoken and politically active group that has condemned gay people on its website as minions of Satan. “You identified yourself as a Calgary Transit employee in connection with your Facebook profile page where you have posted Nazi-related content which is abhorrent and contrary to the values the City promotes,” read the letter. Rau said the Street Church is planning to help him file an unfair dismissal lawsuit. Church officials also said they would be holding a rally in support of Rau at City Hall on Oct. 10. The Pride bus was driven on different routes in the city until the Pride Parade, which took place Sunday.